The other day, as I was in Michael’s doing a little shopping for a home I am decorating soon, I had an idea. It kind of came out of nowhere. 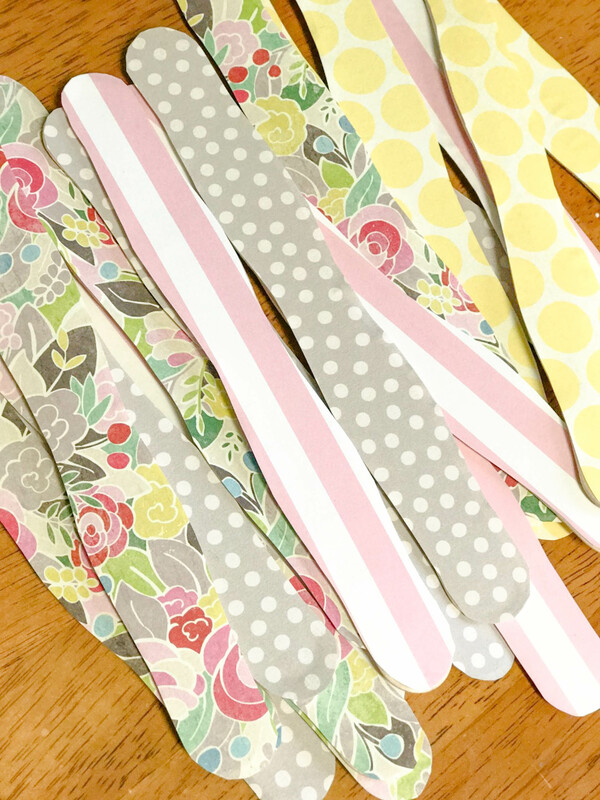 I passed a pack of wavvy Popsicle sticks, and I immediately saw flower petals! Anyone else do this kind of thing? Like, I do this stuff all the time! I guess it is just part of that creative mind, and you just never know when your next idea might hit ya. 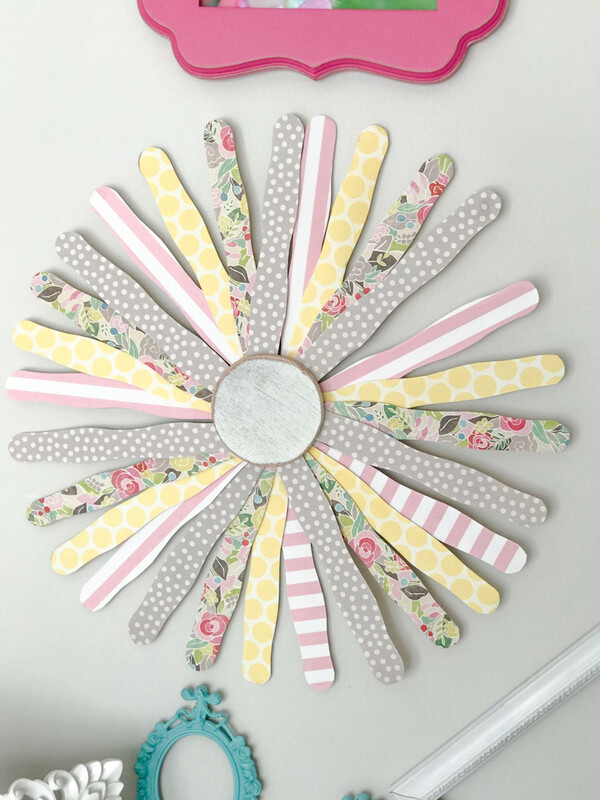 But anyway, I saw the Popsicle sticks and immediately knew that I wanted to make a DIY Popcicle Stick Wall Flower. My original idea and the end result are kind of different, because as you know- sometimes ideas don’t turn out exactly like what you had in mind. You may notice some plant stakes and a foam ball? So, here is what I did! 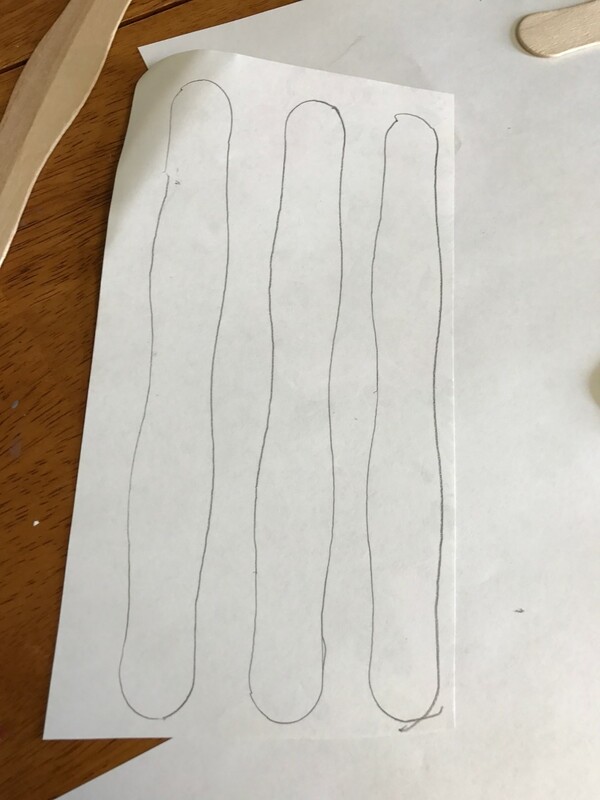 I took my 4 different pieces of scrapbook paper, and I traced a stick several different times on each piece. I am not the best tracer, but you get the point. So, after I traced all of the sticks, I started cutting each one out. It takes a few minutes, but the end result is worth it! When each one was cut, I took the mod podge and adhered it to the stick with a small paint brush (no pic! sorry! 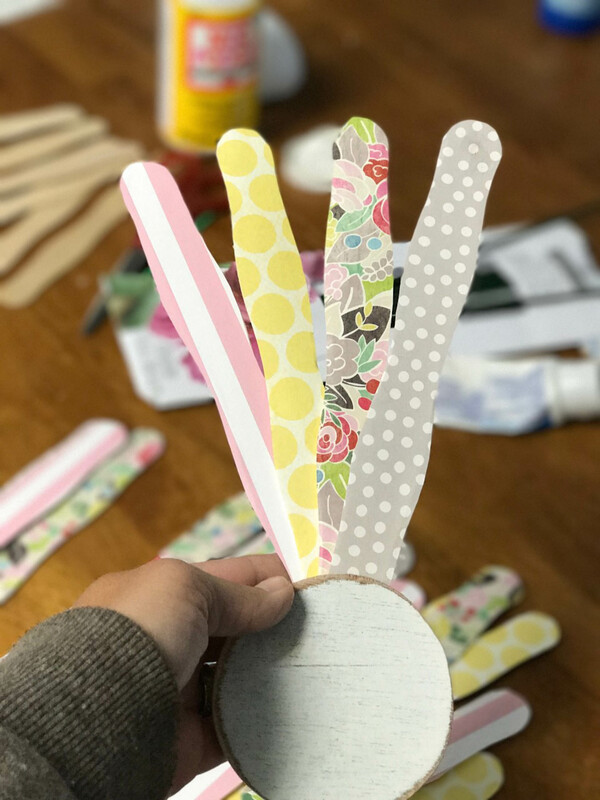 ), and then I placed my cut out paper on top of the mod podged stick and pressed firmly and rubbed it down until it was smooth and all perfectly adhered to the stick! This is what they looked like when I was done! 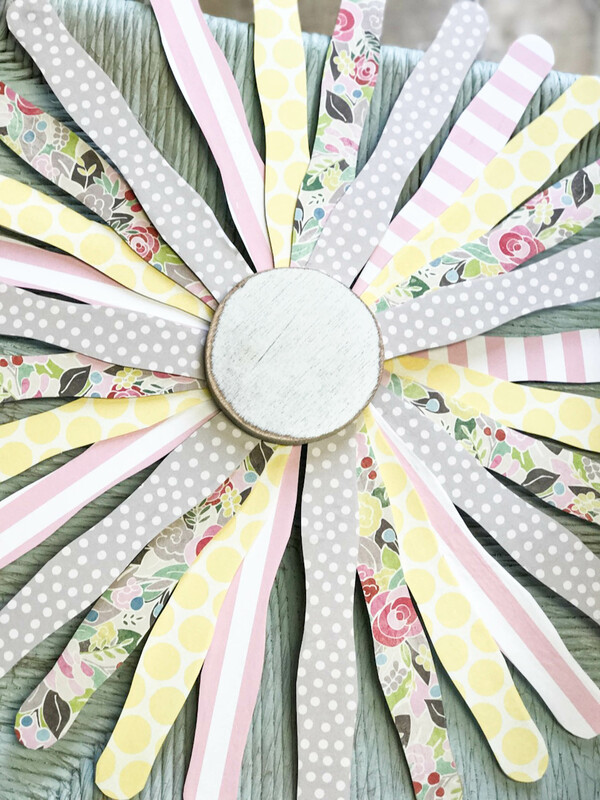 After they were all cut and covered, I got my wooden circle that I had on hand from a previous trip to Michael’s, and I took 4 of the sticks (1 of each design), and I fanned them together in the order I wanted to put them on my flower. 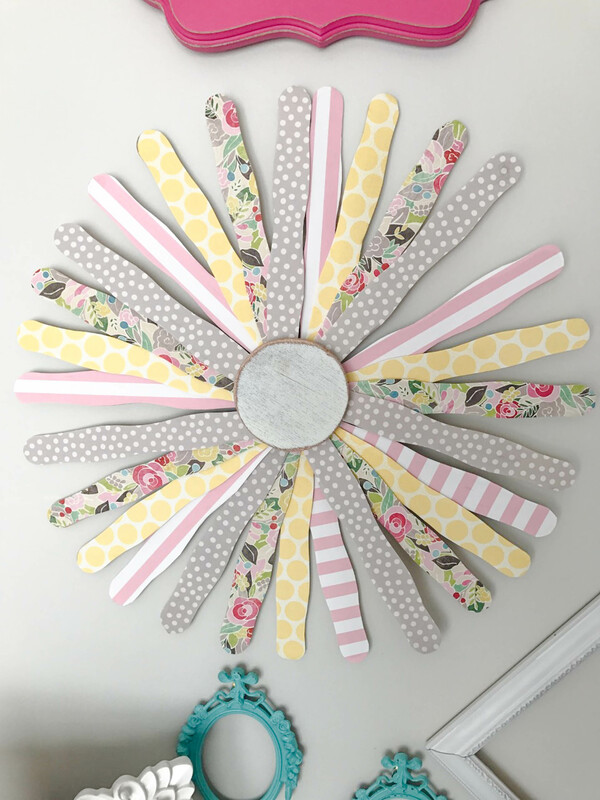 When I had them how I wanted them, I took my hot glue gun and glued each stick in place and then glued them as a whole to the back of the circle. I did this process over and over until the flower was complete! SO easy. Be careful! That glue is HOT to trot! 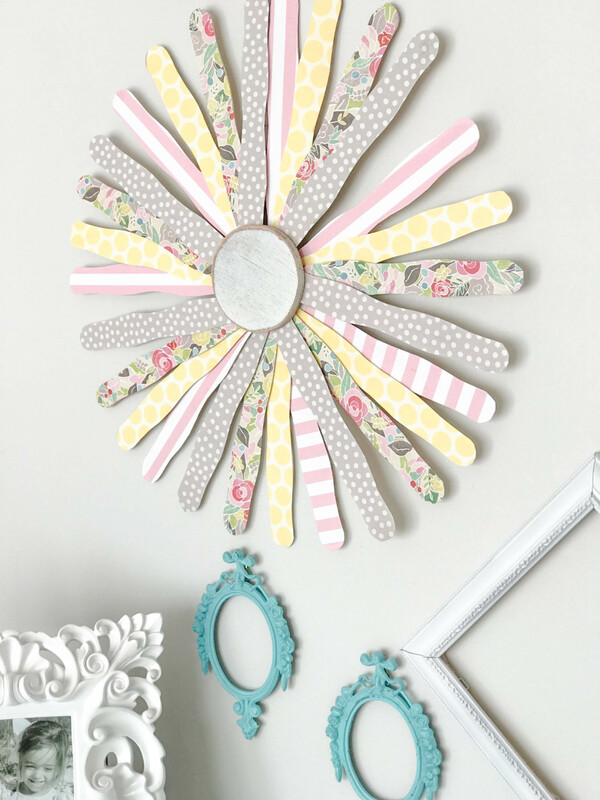 Since I wanted to hang this on my daughter’s wall, I used my hot glue to attach a saw tooth hanger onto the back. 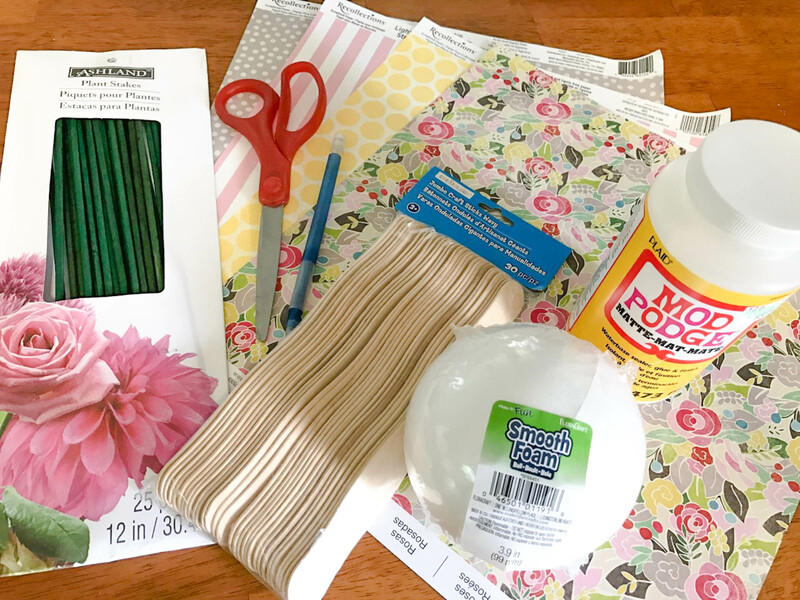 This flower is very light, so the hot glue holds up perfectly for this project. And here is it on her wall! I wish I could show more of her and my son’s shared room while we are living here in our temporary home, but I just can’t. It is disastrous right now. Yikes. So, what do you think? Turned out pretty dang cute if you ask me! 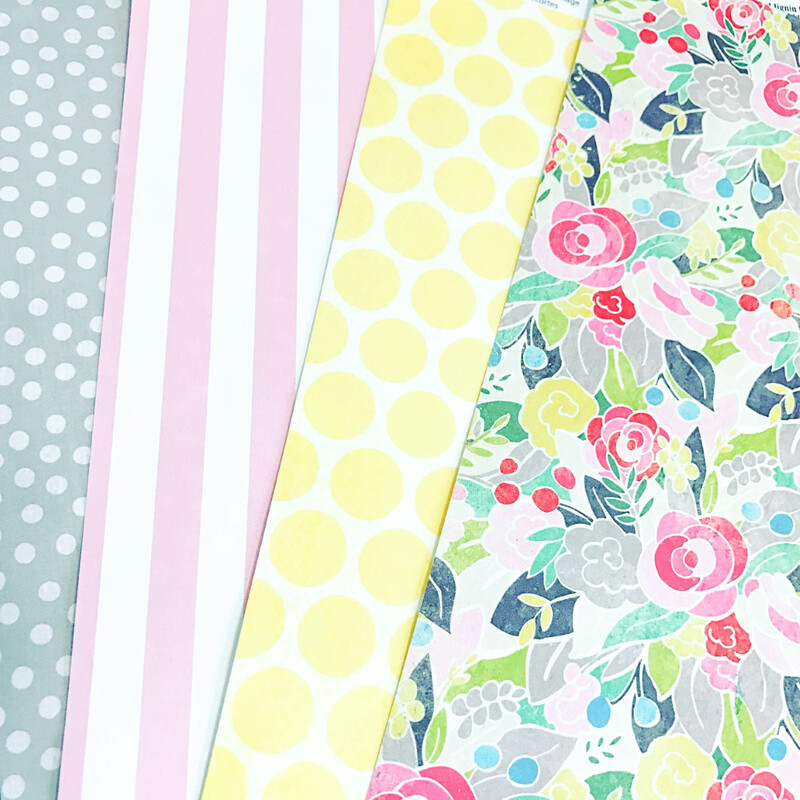 You can do so much with this, just mix and match different patterns and have fun! 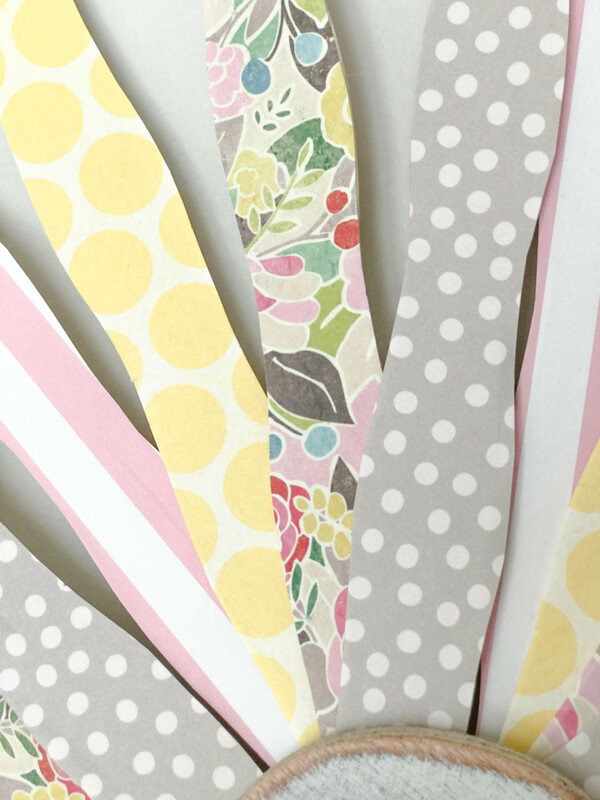 Wouldn’t it be cute to do a wall of flowers, all with different patterns? 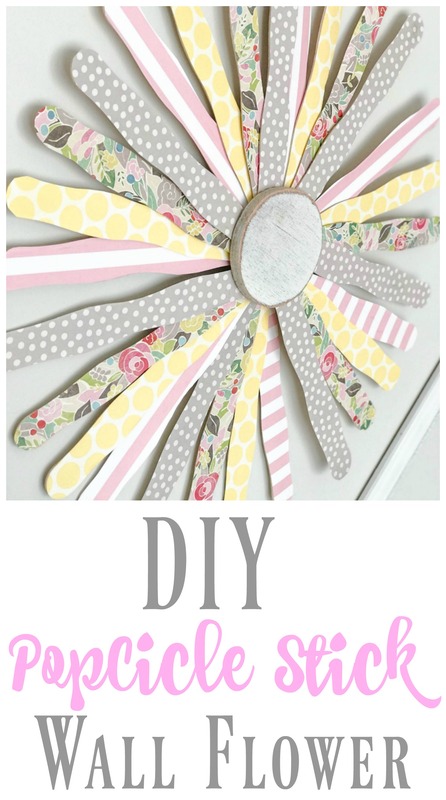 This is so fun and creative! I will have to make one soon too! Love the colors! 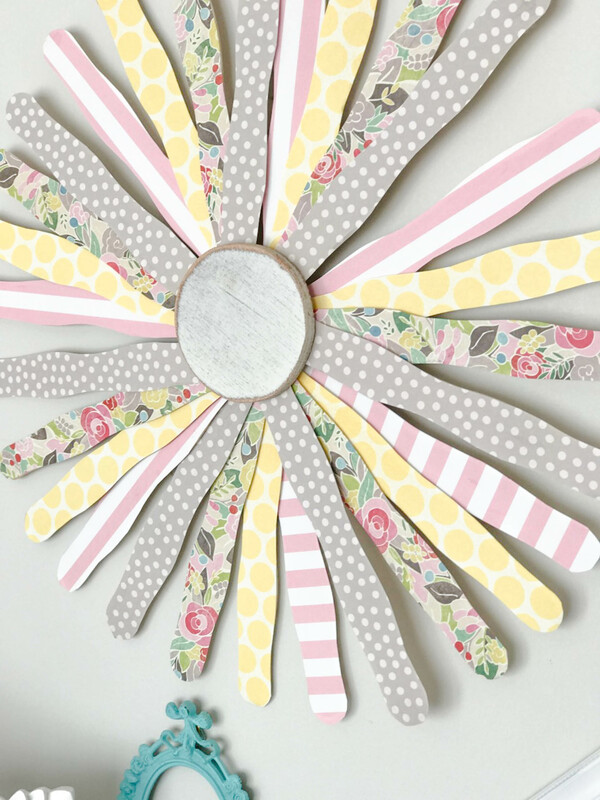 What a fun summer craft! Love the papers you used. Beautiful, you could also add a mirror in the middle.